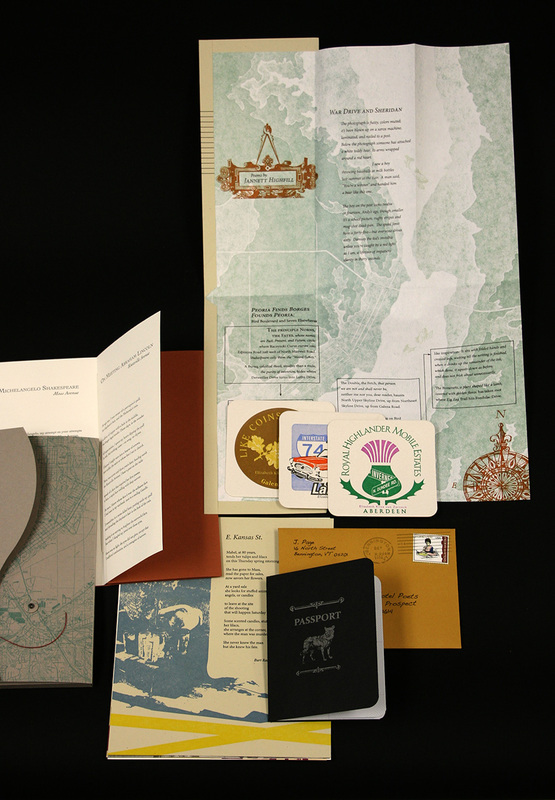 A new book from the Gold Quoin Press, 2013, printed letterpress in an edition of 200 copies. Now available for purchase. (signed and in hardcover box). 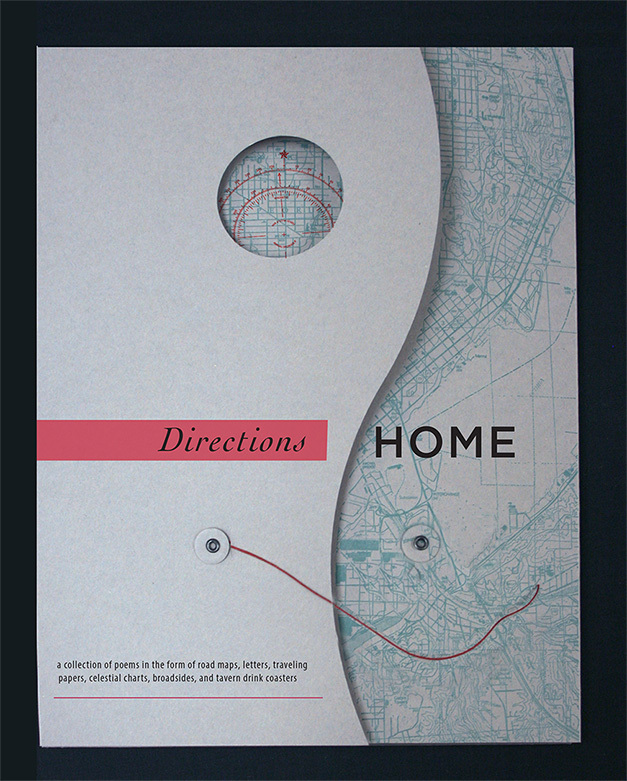 Directions Home is a collection of poems inspired by the names of specific streets, roads, avenues, lanes, and highways found in one Midwestern town. The poems were written by the Grandview Hotel Poets, based in Peoria, Illinois, who meet regularly to share and discuss their work. The group’s earlier collection is entitled Bluffs and Five Bridges: Poems from Peoria. 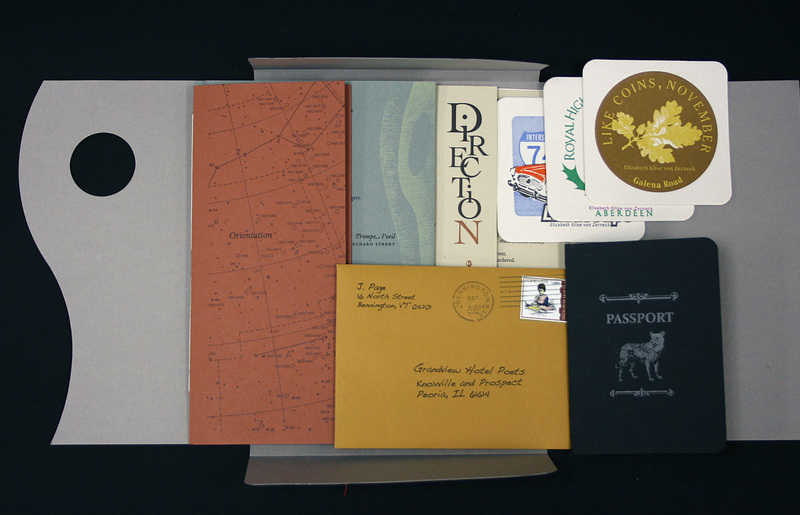 The variety of items included in Directions Home seeks to engage the reader in a physical as well as a literary exploration of the complex feelings about traveling from—and returning to—home. 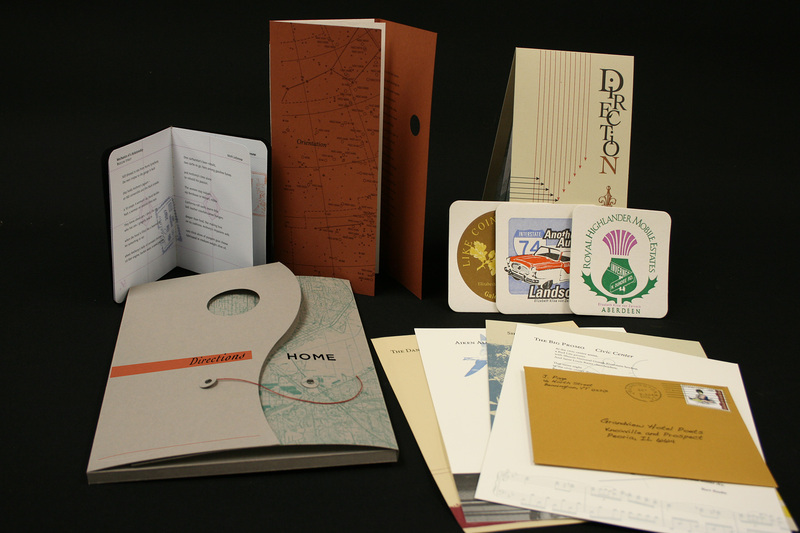 This book came to fruition through collaboration between the Grandview Hotel Poets and the designers and printers associated with Bradley University’s Gold Quoin Press, all of whom share a love of the printed word and the creative possibilities that spring to life under the caring hand of the craftsperson. 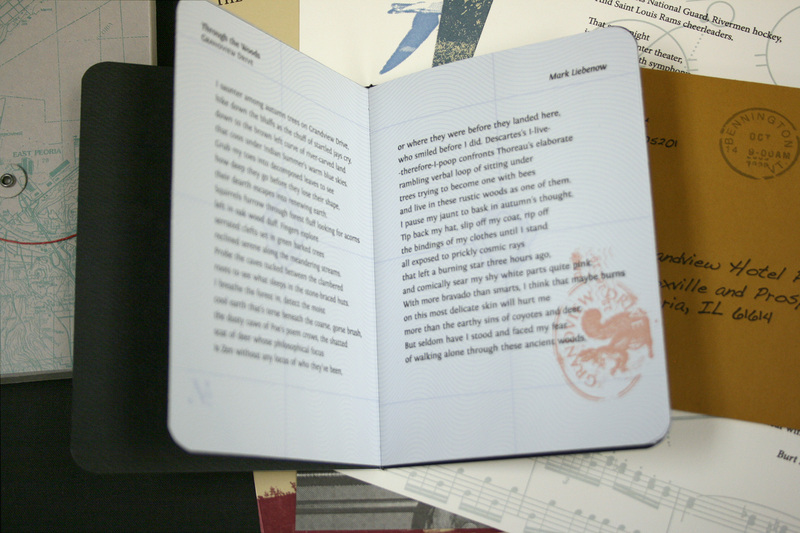 Production Notes: This book was a collaborative effort between the Grandview Hotel Poets and Gold Quoin Press. 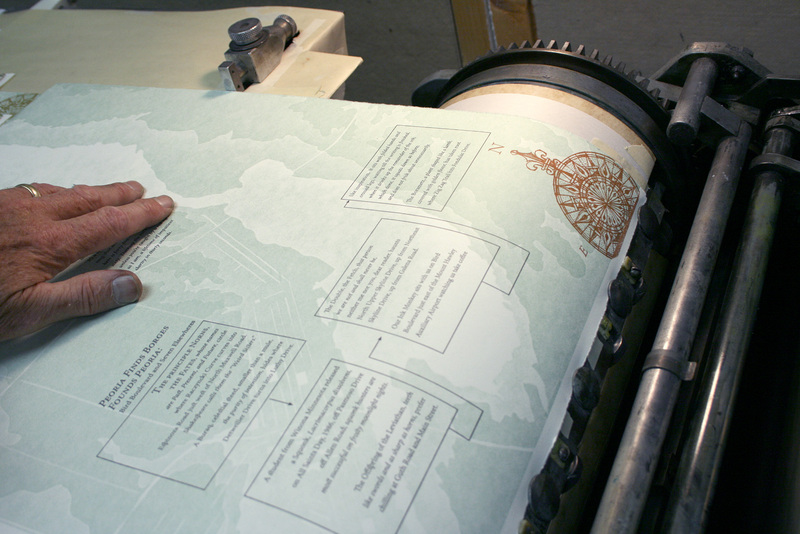 Working together, the authors and designers printed and assembled this book at Bradley University’s book arts studio in four very busy weeks in July and August, 2013. 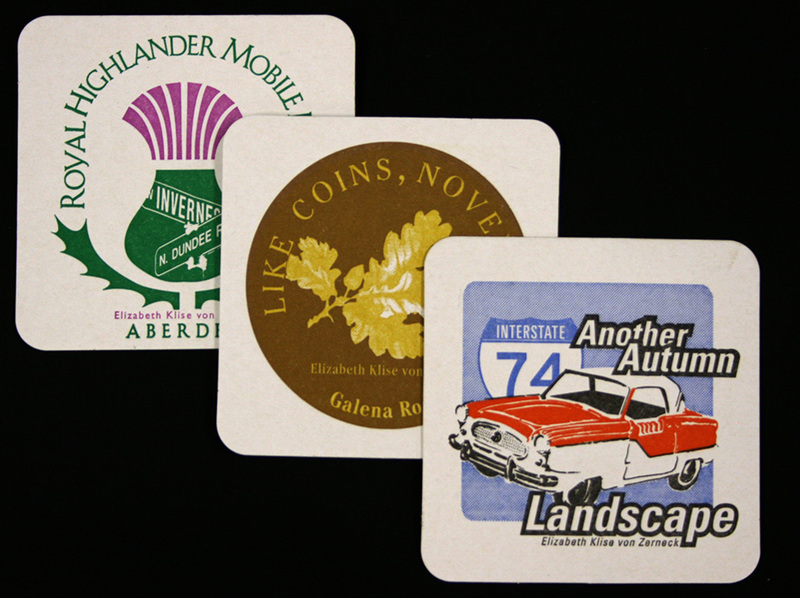 All printing, with one very small exception, was done on a Vandercook Universal One and an SP-15 press using photo-polymer plates, pressure printing, collagraph, and wood type. Special thanks to OSP Printing in Bloomington, IL for die-cutting. 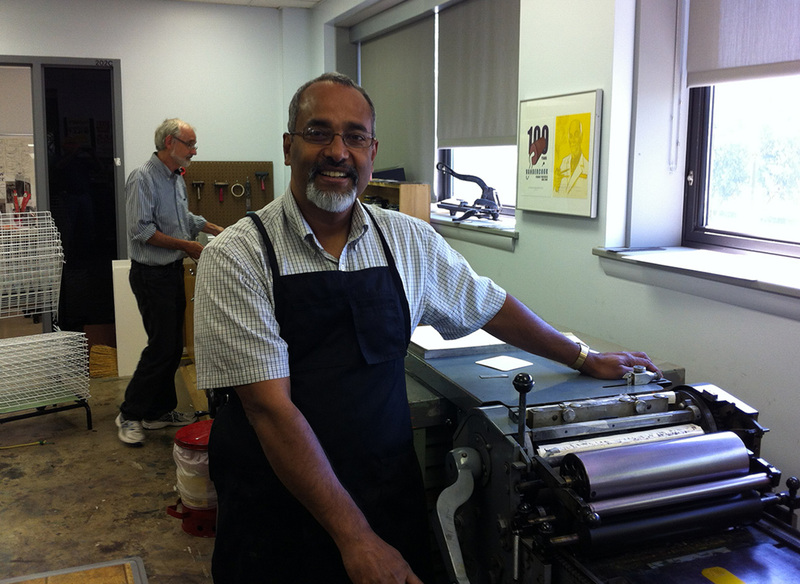 The Gold Quoin Press at Bradley University is dedicated to promoting collaborative endeavors between writers and designers, with an emphasis on experimental letterpress printing and hand binding. The press provides instruction and studio facilities to students and the community. Other titles published by Gold Quoin Press include Unclose the Door by Madeline Wiseman (2012) and Great Day for a Run by Kevin McGuire (2011). This book was printed in an edition of 200 copies. This entry was posted in book arts, Graphic Design, Letterpress, Poetry on August 10, 2013 by admin.